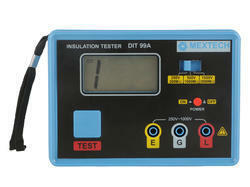 We are one the distinguished suppliers of quality insulation resistance tester in industry. 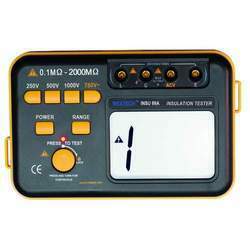 It is very portable handheld instrument which is used for testing the security of power supply instrument. We are offering a wide range of Digital High Voltage Insulation Tester DIT5100 which is used for monitoring, analysis, detection, measurement and testing of various equipment on the basis of physical, electrical, chemical and other parameters. Their utilities are very much beneficial for various industries and considering this fact. this tester is stringently monitored on various parameters. Besides, the offered tester can be availed from us in various technical specifications as per the clients' variegated requirement. Equipped with an external DC power supply socket. Powered by 4 x 1.5V AAA batteries and by mains 230V AC. Powered by 8*AA batteries and by mains 230V AC. Accessories: Instructional manual, Test Leads. 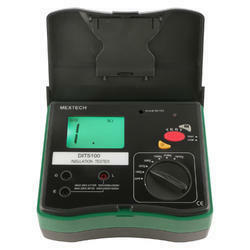 The meter with auto range selection is digital Insulating resistance tester Digital multimeter. It has features of complete functions, high accuracy, reliability in operation. · Display 3 ¾ Digits 4000 Counts , Jumbo LCD display backlight. · Sampling rate 2 times/sec. The meter will turn off after 15 minutes (approx) from last key operation. Battery: 1.5V x 6, AA size. Weight : 650g including the batteries. Accessories: 3 pcs Leads, 6pcs 1.5 V AA Batteries, 3pcs clips, Instruction manual, carrying case gift box. 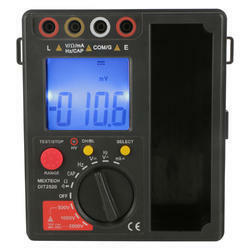 Available with us is Insulation Resistance Tester INSU99A. 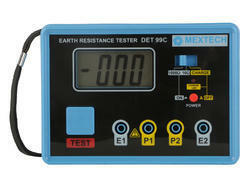 Which can be used to test resistance for security of various power supply instruments. It is very easy to use and operate and display the reading on LED display.